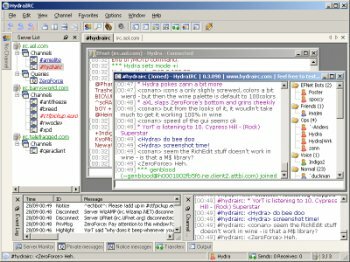 HydraIRC is an IRC Client written in C++ using such modern tools as Visual Studio 7 and WTL/ATL for a super fast, streamlined and efficient program. It features a nice looking, intuitive and though highly customizable GUI, dockable windows, MDI client area, event based core (with user definable events), DLL plugin SDK, multi-server support, and more. Great free client. But i still prefer mIRC. Yes you have to pay for mIRC but only once then its yours forever. Not even close to mIRC? Are you kidding? Free and opensource vs 30 days of nag-screens until you have to pay? Hydra does everything I use IRC for, and even has some features I use that don't come with mIRC. This is a really good client, but still doesn't even come close to mIRC. Did tannman1 just mention pirch? Hey tannman1, 10 years ago called.. they want their IRC Client back. Anyway, hydraIRC is alright but doesn't have anywhere near the experience/time tested-ness that mirc has. mirc has always been the #1 IRC client for Windows and I really don't see that changing any time soon. Have to disagree...I've had both on my computer for a couple years and I rarely use mirc anymore. Can't live without the channel monitor. This will probably never even come close to mIRC, but in terms of alternatives its great really. mIRC is still #1. However this IS a very nice effort. EDIT: New build out! 158! get it from #hydrairc on efnet by following the directions in topic. Would need to offer something similar to aliases/remotes like mIRC before I'd jump the wagon. I looked pretty hard, but if I missed it somebody feel free to flame me. Pretty much the only ICR client I've used in years. Still a little complicated to configure for newbies, but once you get used to it, it's pretty damn good. Very Nice program . Good work ! !